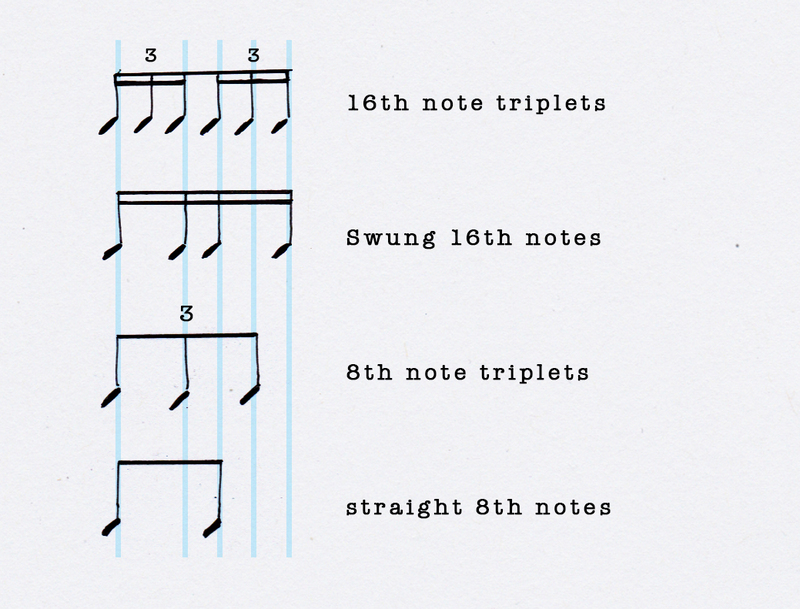 Specifically, swing is referring to shifting normally evenly spaced notes to the first and third triplet partials. The idea of swing also refers to the fluidity of all beat subdivisions. Notes can be moved and positioned between the cracks in anyway as is suitable to the musical situation. All the beat subdivisions within this exercise are written with 8th notes, 8th note triplets, 16th note triplets and 32nd notes. Flams are used to represent the more extreme placement of overly swung feel while 32nd notes are used here to enunciate hi hats after the beat. It is the musicians responsibility to perform what’s on the page with expression and “feel”. there will always be some reliance on the players own swing interpretation. However, the purpose here is to gain precise control of placement before or after the beat – most particularly the hi hat around a strong 8th note pocket. With some exceptions within these groove exercises, the quarter and 8th notes remain strictly in their fixed place – the fluidity is in the shorter notes around these anchor points. 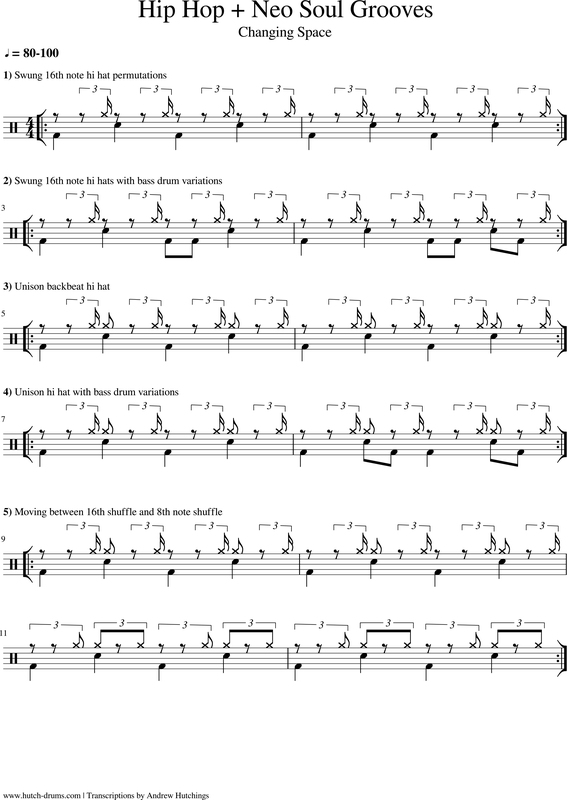 Also included in this pdf, is a transcription of D’Angelo’s “Left and Right”. This is a good example of using space between triplet partials and straight 8th notes. Also herein, is an excerpt from a Chris Dave performance of “Find a Way” from hip hop legends A Tribe Called Quest. Take note of his sticking pattern. The Left hand plays the backbeat as well as the “&’s” on the hi hat. It’s bad arse. Make sure you understand the relationship between 8th notes, 8th note triplets, 16th note triplets and swung 16th notes. There are many more to get to know. 2. Also spend time practicing after the beat. Allow the downbeat or backbeat to fall after the click. You can even shift the phrasing of the entire beat, where the metronome for example, will click a 16th note triplet before the “1”. A good exercise to embolden your sense of time. 3. Listen to the real deal : J Dilla’s Production on A Tribe Called Quest – “Beats Rhymes and Life”, “A Love Movement”, The Roots – “Dilla Joints”, D’Angelo – “Voodoo” co-produced by Questlove, The Drumhedz (Chris “Daddy” Dave), Hiatus Kaiyote (Perrin Moss) and Nate Smith. Play along to the records. 4. Timing and listening is everything. Awesome!! Can’t wait to give this a try 🤗🌟🤙 thank you!